Plant viruses affect many crops and cost billions of dollars annually in preventative measures and damages. In grapevines, most long-distance spread of viruses is caused by the movement of infected plants, which can be controlled effectively if clean stock is made available to growers. Several grapevine clean plant centers, which provide virus testing and cleaning services, have been established throughout the United States. 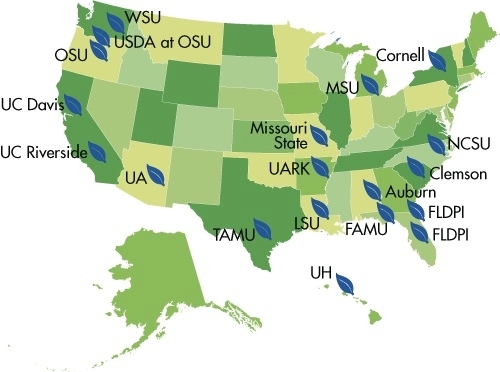 These centers work in partnership with the USDA to provide an inventory of certified virus free plants to commercial nurseries that produce the planting stock for grape growers throughout the United States. Several viruses associated with Grapevine Leafroll-associated viruses have been catalogued, of which Grapevine Leafroll-3 is only one. GLRaV-3 has many strains, some of which cause severe symptoms, while others do not cause symptoms at all. In most varietals, symptoms include the reddening of leaves, with their edges turning downward and rolling under, giving the disease its name. GLRaV-3 causes declines in production and fruit quality, in the form of decreased pigmentation, reduced sugar content, delayed maturity, and reduced yield. GLRaV-3 is vectored mainly by mealybugs, which are common in California vineyards. Leafroll appears to be an increasing problem in California owing to increased mealybug populations, the presence of soft scale, the use of new rootstocks that are less tolerant of the pathogen, and new mutations in Leafroll strains (Carol, 2008). Control mechanisms for the disease are limited but include testing vineyard stock in the ground to learn of sources of inoculum, planting virus-free materials (both rootstock and scion), and removing diseased vines. In our calculations, we allowed for alternative scenarios for disease incidence, removal and replanting of diseased vines, disease spread within and into the vineyard, the effects of the disease on yield, crush prices of grapes, and several other pertinent characteristics. We estimated the change in economic welfare of producers and consumers resulting from the presence of the disease, and from the availability of certified virus-free grapevines for the North Coast region. To estimate the losses to growers from Leafroll, we compared various scenarios for vineyard management when Leafroll is present, with a scenario in which there is no Leafroll in the vineyard. Among the scenarios we considered, losses are maximized when growers plant initially with non-certified stock and then rogue and replant diseased vines with more non-certified vines; growers lose an average of $1,138 per acre per year in this scenario. (In fact, they would be better off not replanting in this scenario.) Losses are minimized when growers initially plant with certified stock and then rogue and replant with certified stock. In that scenario, GLRaV-3-induced losses are approximately $600 per acre per year. To estimate the benefits to growers from using certified stock, we compared a scenario in which vineyards were planted with certified stock and vines were replanted with certified stock if they became diseased, with an alternative scenario in which vineyards were planted and replanted with non-certified stock. The value of certified stock for a representative acre is $533 per year. Scaling up by the 100,424 acres in the region and assuming 100% adoption of certified stock, the total potential benefit from utilizing the certified stock is $53.5 million per year, representing roughly 6.4% of the average annual grape crush revenue in the North Coast. The value of the certification program varies depending alternative scenarios and disease incidence in non-certified stock. We assume a disease incidence in certified stock of 10% in the calculations above, but if the disease incidence for non-certified vines were 5%, the annual benefit from using certified stock would be $321 per acre, and the regional value would be $32.3 million—about 3.8% of the regional revenue. If the incidence in non-certified stock were as high as 30% (the estimated in-field baseline incidence), then the average annual value of certification is $3,284 per acre, with a regional value of $329.8 million, approximately 40% of regional revenue. Our estimates of the value of the certification program are heavily dependent on the disease incidence in newly purchased, non-certified vines. Our best estimate for that incidence is 10%, but if new vines were to have the same incidence as vines in the field, it would be 30%. The total annual benefit from the program ranges from approximately $32.3 million with 5% GLRaV-3 incidence in the non-certified vines, up to nearly $330 million if non-certified vines have 30% disease incidence. These calculations include only the benefits to a single region from efforts to prevent the spread of a single disease. The total benefits would be much higher, allowing for other diseases and other regions. It is also important to note that these calculations are based on specific assumptions about vineyard and market conditions, but they suggest that the clean plant certification program is very cost-effective and that choosing to plant with certified stock is economically beneficial for growers. Fuller, K. B., Alston, J. M., Golino, D. A., 2013. The Benefits from Certified Virus-Free Nursery Stock: A Case Study of Grapevine Leafroll-3 in the North Coast Region of California. Robert Mondavi Institure Center for Wine Economics Working Paper No. 1306. Availale: http://vinecon.ucdavis.edu/publications/cwe1306.pdf. American Vineyard Foundation, 2012. 2012 Research Priority Survey Results. Accessed 15 August, 2013, available at http://www.avf.org/results.html. Carol, B., 2008. 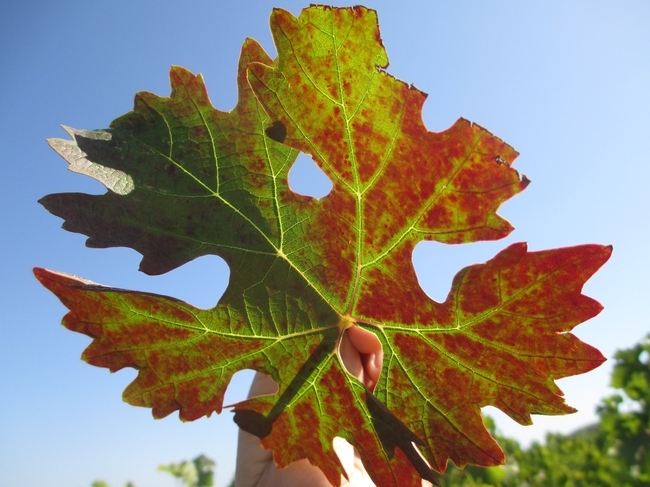 Grapevine Leafroll Virus Increasingly a Problem in California Vineyards. Accessed July 10, available at http://westernfarmpress.com/grape-leafroll-virus-increasingly-problem-california-vineyards-0. Tsai, C. W., Chau, J., Fernandez, L., Bosco, D., Daane, K. M., Almeida, R. P. P., 2008. Transmission of Grapevine leafroll-associated virus 3 by the vine mealybug (Planococcus ficus). Phytopathology. 98, 1093–1098. Please note, this article will also be published on the Coffee Shop blog at Lodigrowers.com.